I was nosing around on various UFO and paranormal sites recently, and on The UFO Iconoclast(s) I found a link to a book review on a site called Reviews of the Mysterious Kind. The book is called Sliders: The Enigma of Streetlight Interference, by Hilary Evans. According to this book, Sliders are people who possess the ability to turn streetlights on and off by simply being near them. Apparently there’s evidence that this ability can be controlled, which pretty much makes it the lamest super-power ever. I had never heard of this phenomena before stumbling across the review (written by Nick Redfern), but I have to admit the whole thing is kind of intriguing. 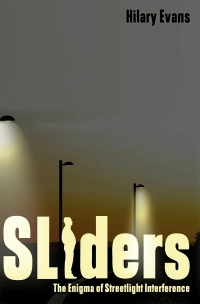 Read Nick’s review right here, and you can buy Sliders: The Enigma of Streetlight Interference at Amazon.com.